In signal processing, white noise is a random signal with a constant power spectral density. The term is used, with this or similar meanings, in many scientific and technical disciplines, including physics, acoustic engineering, telecommunications, statistical forecasting, and many more. 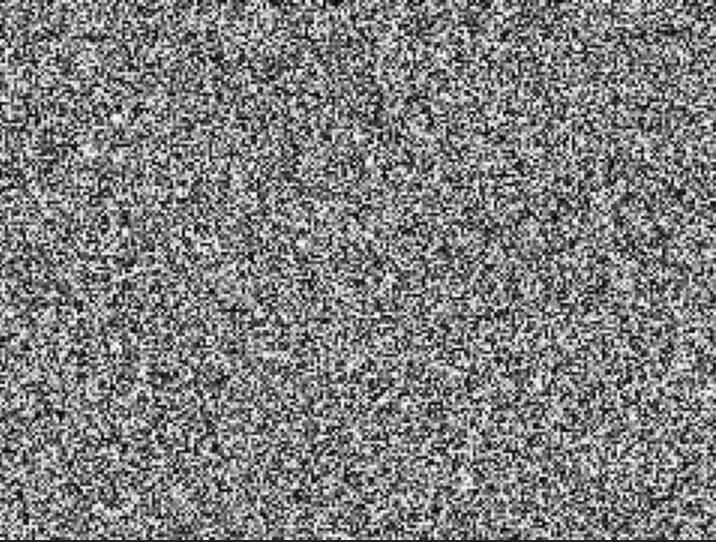 White noise refers to a statistical model for signals and signal sources, rather than to any specific signal.A “white noise” image.In discrete time, white noise is a discrete signal whose samples are regarded as a sequence of serially uncorrelated random variables with zero mean and finite variance; a single realization of white noise is a random shock. Depending on the context, one may also require that the samples be independent and have the same probability distribution (in other words i.i.d is a simplest representative of the white noise). In particular, if each sample has a normal distribution with zero mean, the signal is said to be Gaussian white noise.The samples of a white noise signal may be sequential in time, or arranged along one or more spatial dimensions. In digital image processing, the pixels of a white noise image are typically arranged in a rectangular grid, and are assumed to be independent random variables with uniform probability distribution over some interval. The concept can be defined also for signals spread over more complicated domains, such as a sphere or a torus.0:00Some “white noise” sound.An infinite-bandwidth white noise signal is a purely theoretical construction. The bandwidth of white noise is limited in practice by the mechanism of noise generation, by the transmission medium and by finite observation capabilities. Thus, a random signal is considered “white noise” if it is observed to have a flat spectrum over the range of frequencies that is relevant to the context. For an audio signal, for example, the relevant range is the band of audible sound frequencies, between 20 and 20,000 Hz. Such a signal is heard as a hissing sound, resembling the /sh/ sound in “ash”. In music and acoustics, the term “white noise” may be used for any signal that has a similar hissing sound.White noise draws its name from white light, although light that appears white generally does not have a flat spectral power density over the visible band.The term white noise is sometimes used in the context of phylogenetically based statistical methods to refer to a lack of phylogenetic pattern in comparative data. It is sometimes used in non technical contexts, in the metaphoric sense of “random talk without meaningful contents”.